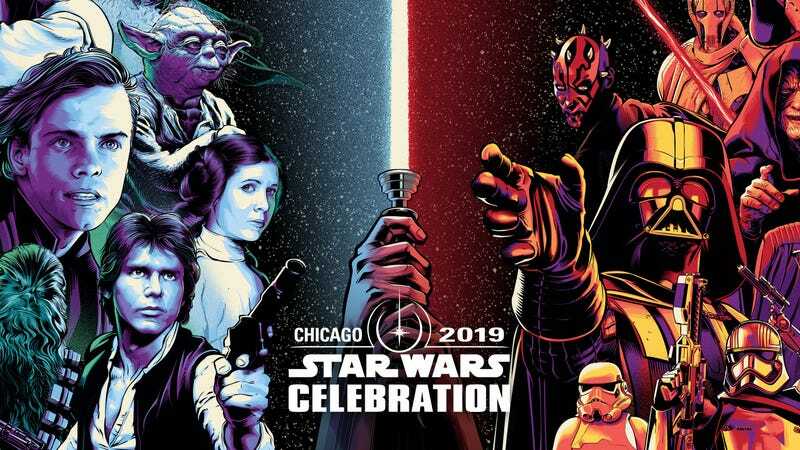 The key art for Star Wars Celebration Chicago. The convention runs from April 11-15, and it’s where fans will absolutely be learning more about what’s coming from the future of Star Wars. However, since the full schedule has been revealed, we can start guessing at what won’t be announced. Here’s the breakdown. Do not expect to learn about Rian Johnson’s new Star Wars movies, or any new Star Wars movies, at Celebration this year. At past Celebrations, there has been a “Future Filmmakers” panel late in the event that revealed information on the movies coming, well, in the future. But seeing as how those panels a) almost announced a Boba Fett movie directed by Josh Trank, and b) featured Phil Lord and Chris Miller, this year no such panel exists. Plus, with news certainly coming on Episode IX, Disney wouldn’t want the focus to be taken away from that. Meaning, whatever Disney has planned for Star Wars movies after Episode IX—be it the David Benioff and D.B. Weiss or Rian Johnson movies—will likely remain a mystery for now. A Cassian Andor show is coming, but we’re unlikely to learn much about it. In the description of the Star Wars Rebels panel at Celebration, it very clearly states “Full disclosure—we are not announcing a new series in this panel.” That seems to be the prevailing attitude toward any upcoming or rumored TV shows. There will be no update on anything involving the whereabouts of Rebels characters, and despite persistent rumors of multiple live-action TV shows in development, there’s simply no panel where that could happen. The focus, as it should be, is on the one we’re seeing first: The Mandalorian. The one place we may get a sliver of news on future TV shows is a panel called “In Conversation with Alan Tudyk,” where it’s possible he reveals whether or not K-2SO will appear in the Cassian Andor show. Rumors about Star Wars video games are almost as rampant as the movie and TV projects, so fans always assume a convention would be a good time to reveal something brand new. Celebration will have that, just in the form of Star Wars Jedi: Fallen Order. Like TV and movies before it, Celebration is choosing to focus on one big release in each category, and that’s it. Lucasfilm president Kathleen Kennedy and director J.J. Abrams are ready to reveal their movie to the world. Yes. Finally. It’s happening. Mark your calendars and get excited (as if you weren’t already). In search of a new photo from this show. Up until now, all we’ve had is this picture. This picture and some casting. At Celebration, though, we are going to get more information on the show, its characters, and maybe when it’ll debut. It’s also probably safe to assume we’ll see the first footage too. The Clones are back in town. People forget that there’s another Star Wars show coming to Disney+ in the future. It’s the return of The Clone Wars. Finally, the fan favorite Disney show is going to get the finale it deserves—and while we’ve seen a glimpse already, there’s a good chance the panel will have much, much more. We’re mere weeks removed from the end of Star Wars Resistance season one, and season two is likely to be the next new piece of Star Wars canon story we see in the future. What’s up with Kaz and the Colossus? That question will be explored at Celebration. Virtual reality? More like Vader reality. VR has been one of the coolest new ways to experience Star Wars since Disney bought its parent company in 2012. First, there was Trials on Tatooine, Secrets of the Empire, and AR experiences like Jedi Challenges. The next major addition, Vader Immortal, will be further unveiled and likely playable for people in attendance. No photos of Fallen Order exist, so here’s another Jedi who existed around the time the game is set. I’m sure he’s got a bright, happy future! Have you played the crap out of Battlefront II and are just waiting on the next big Star Wars game? Well, look no more. Celebration will feature “the galaxy-wide premiere” of this brand new, in-canon, action game which tells the story of a Jedi Padawan shortly after the events of Revenge of the Sith. Master and Apprentice, seen here with its exclusive Celebration cover, has already been announced, but could other similar books be coming? This has become a given at Star Wars Celebration but that doesn’t make it any less exciting. The teams from Hasbro, Marvel, Del Ray, and more all have panels (some have multiple) to discuss their future work with Star Wars and reveal new projects. We’re not sure how you could want to learn more beyond these two fine articles written by yours truly, but there will be a Galaxy’s Edge panel at Celebration and the description says “there might just be a few surprises, too!” What that could be is anyone’s guess, but we’re excited to find out. 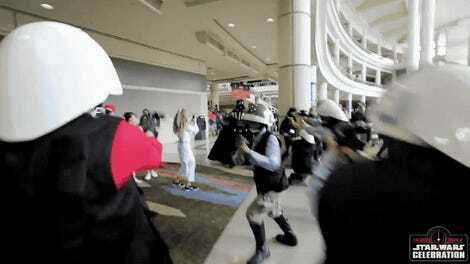 Stay tuned to io9 for all the biggest updates from Star Wars Celebration, which happens April 11-15 in Chicago, IL.